Keynote Address by Ira A. Lipman Honorary Chairman of the National Conference of Christians and Jews, June 1, 1994. IT IS AN HONOR TO BE HERE TONIGHT TO PAY TRIBUTE TO MY FRIEND AND ADVISOR, KEN MAKOVSKY. I HAVE KNOWN KEN FOR TWENTY YEARS, AND I CAN ASSURE YOU THERE IS NO ONE MORE DESERVING OF THE STANLEY M. ISAACS HUMAN RELATIONS AWARD. KEN’S DEDICATION TO PROFESSIONAL EXCELLENCE HAS BEEN MATCHED BY HIS COMMITMENT TO THE IDEALS OF THE AMERICAN JEWISH COMMITTEE. HE HAS WORKED TO PROMOTE UNDERSTANDING OF ISRAEL AND THE AMERICAN JEWISH COMMUNITY BOTH AT HOME AND ABROAD, AND THROUGHOUT HIS CAREER HE HAS FOSTERED THE CAUSE OF HUMAN RIGHTS WHEREVER THEY ARE THREATENED. BECAUSE HE KNOWS THAT A THREAT TO ONE IS A THREAT TO ALL, AND THAT IF PEOPLE’S INDIVIDUAL WORTH, EFFORTS, AND ACCOMPLISHMENTS CAN BE OUTWEIGHED BY THE COLOR OF THEIR SKIN, THEIR LIFESTYLE, THE WAY THEY PRAY, OR WHERE THEY COME FROM, THEN WE ARE ALL IN DANGER. WE DO NOT HAVE TO LOOK TO BOSNIA, GERMANY, OR THE MIDDLE EAST TO SEE THE REWARDS OF IGNORANCE, INTOLERANCE, AND HATRED. THERE IS AMPLE EVIDENCE HERE IN THE UNITED STATES OF THE BIGOTRY THAT IS AN ETERNAL ENEMY OF DEMOCRACY AND PLURALISM. AS LEADERS OF THE COMMUNITY, IT IS UP TO US TO MAKE CERTAIN THAT EVERYONE UNDERSTANDS HOW OUR NATION WAS BUILT ON THE STRENGTH OF PEOPLE DRAWN FROM ALL OVER THE WORLD, WHO CAME TO THESE SHORES IN SEARCH OF JUSTICE, FREEDOM, OPPORTUNITY, AND A BETTER LIFE. THE INTERPLAY OF DLFFERENT CUSTOMS, RACES, LANGUAGES, RELIGIONS, AND NATIONALITIES IS ONE OF THE BASES OF OUR DYNAMIC POLITICAL AND ECONOMIC SYSTEMS. THE INTERWEAVING OF THESE DIFFERENT BUT COMPLEMENTARY STRANDS IS WHAT MAKES OUR SOCIAL FABRIC SO UNIQUE IN ITS STRENGTH AND RESILIENCE. BY PRESERVING OUR SOCIAL AND POLITICAL WAY OF LIFE, WE STRENGTHEN FREE ENTERPRISE, WHICH ALLOWS EVERYONE — GIVEN THE OPPORTUNITY — TO RISE TO THE LEVEL OF HIS OR HER EXCELLENCE. BUT WE MUST NEVER FORGET THAT PRESERVING OUR WAY OF LIFE REQUIRES A DELICATE BALANCE BETWEEN FREEDOM AND RESTRAINT. CAPITALISM AND ENTREPRENEURSHIP, AS WONDERFUL AS THEY ARE, ALSO PROMOTE FORMS OF INDIVIDUAL INITIATIVE IN DRUG DEALING AND SALES OF ILLEGAL GUNS THAT WE MUST NOT ALLOW TO FLOURISH IN THIS GREATEST OF ALL NATIONS. WE ARE TRULY PENNY-WISE AND POUND-FOOLISH IF IN THE NAME OF FREEDOM WE PERMIT ACTIVITIES THAT BY THEIR VERY NATURE DESTROY OUR FREEDOM. NOR CAN WE SEPARATE THE VITALITY OF OUR ECONOMIC SYSTEM FROM THE DEMOCRATIC POLITICAL SYSTEM ON WHICH IT IS FOUNDED. THROUGH DEMOCRACY, FREE ENTERPRISE, AND THE ENTREPRENEURIAL SPIRIT, WE CREATED THE GREATEST ECONOMIC ENGINE THE WORLD HAS EVER SEEN. WE SURVIVED THE GREAT DEPRESSION, TWO WORLD WARS, AN OIL EMBARGO, AND THE THREAT OF COMMUNISM. FROM THE COMMUNIST SYSTEM, WE LEARNED THAT WITHOUT FREE ENTERPRISE, THERE IS NO OPPORTUNITY. MUCH OF THE FAILURE TO APPRECIATE THE CULTURAL DIVERSITY OF OUR NATION COMES FROM A MISUNDERSTANDING OF OUR POLITICAL AND ECONOMIC SYSTEM. DEMAGOGUES ARE ABLE TO PIT ONE GROUP AGAINST ANOTHER BECAUSE IT TOO OFTEN SEEMS THAT OUR NATIONAL LIFE IS A ZERO- SUM GAME, WHERE ONE CAN GAIN ONLY WHAT SOMEONE ELSE LOSES. OR A KIND OF RAFT DEBATE WITH THE WINNERS ALREADY DECIDED. IF YOU HAVE EVER HEARD A RAFT DEBATE, YOU KNOW HOW IT WORKS. ASSUME A BOAT HAS SUNK IN MID-OCEAN AND FIVE PEOPLE HAVE SURVIVED. BUT THEIR RAFT HAS ROOM FOR ONLY FOUR. THE SURVIVORS — WHO MIGHT INCLUDE A MINISTER, AN ARTIST, A LAWYER, AN ENGINEER, AND AN ECONOMIST — ENGAGE IN A DEBATE, MAKING THE BEST CASE THEY CAN FOR WINNING A PLACE ON THE RAFT. THE MINISTER MIGHT ARGUE THAT A COMMUNITY WITHOUT RELIGION IS NOT WORTH SAVING IN ANY CASE. THE ARTIST MIGHT SAY THAT ART IS WHAT SEPARATES THE HUMAN RACE FROM THE LOWER ANIMALS, AND THAT A COMMUNITY WITHOUT ART IS NOTHING MORE THAN A ZOO WITHOUT WALLS. THE LAWYER MIGHT ARGUE THAT A COMMUNITY NEEDS LAWYERS BECAUSE WITHOUT THEM THERE CAN BE NO JUSTICE, NO RIGHTS, AND NO SECURITY. THE ENGINEER WOULD BE LIKELY TO MAKE A MORE PRACTICAL ARGUMENT, THAT HE DESERVES A PLACE ON THE RAFT BECAUSE A COMMUNITY MUST HAVE SOMEONE WHO KNOWS HOW TO MAKE THINGS WORK. FINALLY, THE ECONOMIST MIGHT ARGUE THAT NO ADVANCED SOCIETY CAN EXIST WITHOUT AN ECONOMIST TO DESIGN AN EFFICIENT MEANS OF CREATING AND DISTRIBUTING WEALTH, AND MANAGING A COMPLEX FINANCIAL SYSTEM. A RAFT DEBATE IS AN INTERESTING LEARNING EXPERIENCE. IT FORCES YOU TO DEFINE WHAT YOU MEAN BY COMMUNITY, TO DECIDE WHAT MAKES FOR A GOOD SOCIETY, TO EXAMINE WHAT YOU MEAN BY INDIVIDUAL WORTH AND SOCIAL VALUE. BUT IF WE ADD TO OUR GROUP OF ARTICULATE DEBATERS ONE WHO HAS NO VOICE — AN INNER CITY BLACK, AN ILLEGAL IMMIGRANT, AN HISPANIC, OR ONE OF THE HOMELESS — THEN IT BECOMES PAINFULLY CLEAR WHY DEMAGOGUES HAVE SUCH SUCCESS AMONG THE DISILLUSIONED, THE DESPAIRING, AND THE DISFRANCHISED. BECAUSE THIS RAFT DEBATE TOO CLOSELY REFLECTS THE POLITICAL, ECONOMIC, AND SOCIAL SITUATION IN AMERICA TODAY. IF WE THINK FOR A MOMENT OF OUR SOCIETY AS A RAFT, WHO HAS BEEN DECLARED EXPENDABLE, IN DEEDS IF NOT IN WORDS? THE HOMELESS ARE EXPENDABLE, LITTERING THE SIDEWALKS OF OUR CITIES LIKE DEBRIS FROM THE SHIPWRECK OF CIVILIZATION. WHO ELSE HAS BEEN EXCLUDED FROM OUR IMAGINARY RAFT? — THE POOR OF THE INNER CITIES, MOSTLY BLACK, BARELY EDUCATED, AND PERMANENTLY UNEMPLOYED. THEY LIVE WITH RATS IN THEIR APARTMENTS AND DRUG DEALERS IN THEIR STREETS. A BLACK BABY IS MORE THAN TWICE AS LIKELY AS A WHITE BABY TO DIE BEFORE REACHING HIS OR HER FIRST BIRTHDAY. THERE IS NO ROOM ON THE RAFT FOR THE 20 TO 30 MILLION ILLITERATE ADULTS IN OUR MIDST. NO ROOM FOR POOR HISPANICS. NO ROOM FOR THOSE WHO LACK THE EDUCATION NEEDED TO MAKE IT IN OUR INCREASINGLY COMPLEX, TECHNOLOGICAL SOCIETY. WHAT CAN WE DO, TO WHOM SO MUCH HAS BEEN GIVEN? WE MUST REJECT THE NOTION OF A NATIONAL RAFT DEBATE, AND WE MUST REFUTE ITS ASSUMPTIONS. BECAUSE OUR SOCIETY IS NOT A RAFT. TO SHARE IS NOT TO SHRINK. AND NO ONE IS EXPENDABLE. INSTEAD, WE MUST THINK OF OUR SOCIETY AS A BANQUET TABLE, TO WHICH ALL OF US HAVE BEEN INVITED. WE WERE NOT INVITED BECAUSE OF OUR INTELLIGENCE, OR EDUCATION, OR BUSINESS ACHIEVEMENTS, OR THE ELEGANCE OF OUR TABLE MANNERS. WE WERE INVITED BECAUSE WE ARE ALL CHILDREN OF GOD. WHO IS SO BOLD AS TO TELL THE HOST THAT IT IS TIME TO BOLT THE DOORS, THAT THERE IS NOT ENOUGH TO GO AROUND, THAT THOSE PEOPLE OUTSIDE HAVE LOST THEIR INVITATIONS, OR DID NOT DESERVE THEM IN THE FIRST PLACE, OR WILL EMBARRASS US WITH THEIR LACK OF ETIQUETTE? THE INCREASING FEAR OF MANY THAT THERE IS NO PLACE FOR THEM IN OUR SOCIETY IS A THREAT TO OUR ENTIRE WAY OF LIFE. AND THAT FEAR — WHICH LIES AT THE BASE OF SO MUCH BIGOTRY, PREJUDICE, AND HATRED — IS BORN OF IGNORANCE, FED BY MISTRUST, AND KEPT ALIVE BY MISUNDERSTANDING. RECENT TRENDS ACROSS THE COUNTRY WARN US AGAINST COMPLACENCY. HATE CRIMES ARE INCREASING. SYNAGOGUES ARE AGAIN THE TARGET OF BIGOTS. INCIDENTS OF RACISM AND ETHNIC CONFLICT ARE ON THE RISE. FROM DAVID DUKE TO LOUIS FARRAKHAN, DEMAGOGUES ARE SPREADING THEIR POISON. THIS IS WHY KEN MAKOVSKY’S WORK IS SO IMPORTANT AND WHY WE HONOR HIM TONIGHT. FOR AS LONG AS THERE ARE MEN AND WOMEN LIKE KEN, WE KNOW THAT OUR STRUGGLE WILL NOT BE IN VAIN — BUT IN HOPE. WE HONOR KEN FOR HIS LIFELONG DEDICATION TO HUMAN RIGHTS AND HIS INSISTENCE THAT WE COUNTER IGNORANCE WITH ENLIGHTENMENT, MISTRUST WITH INSIGHT, AND MISUNDERSTANDING WITH KNOWLEDGE. WE HONOR KEN FOR HIS COMMITMENT TO PROMOTING THE BELIEF THAT THE STRENGTH OF OUR NATION IS IN ITS DIVERSITY AND ITS MORAL POWER IN ITS JUSTICE. WE HONOR KEN FOR EDUCATING OUR PEOPLE AND THE PEOPLE OF THE WORLD ON THE IMPORTANCE OF PLURALISM AND THE MEANING OF DEMOCRACY, FOR WE MUST NEVER ALLOW ANYONE TO FORGET WHAT HAS HAPPENED IN DIFFERENT TIMES AND PLACES, WHEN NATIONS ALLOWED MISUNDERSTANDING AND IGNORANCE TO OVERWHELM THEIR SENSE OF FAIRNESS AND TOLERANCE. — AND THAT THEY, TOO, WILL LIVE IN A NATION WHERE A DANGER TO ONE IS RECOGNIZED AS A DANGER TO ALL. KEN, PLEASE COME JOIN ME AT THE PODIUM. 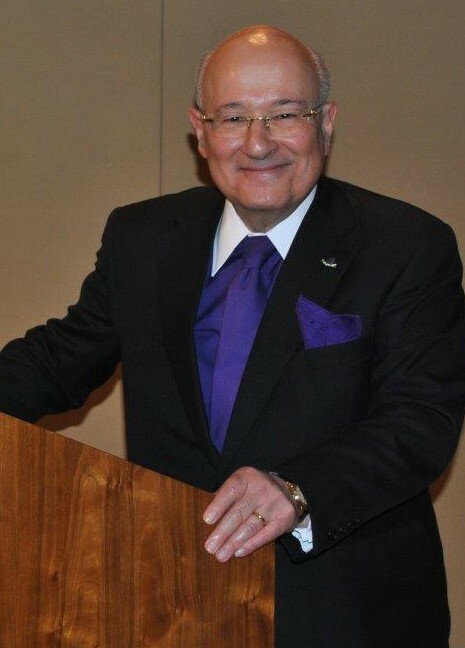 THE AMERICAN JEWISH COMMITTEE STANLEY M. ISAACS HUMAN RELATIONS AWARD IN HONOR OF KENNETH MAKOVSKY IN RECOGNITION OF EXCEPTIONAL LEADERSHIP IN FORGING TIES BETWEEN THE JEWISH COMMUNITY AND OTHER PEOPLES OF THE WORLD.